During a course in "conversational" Spanish, our teacher gave us some popular phrases. Among them is one that really stuck in my mind. When parting from a friend, say, "Vaya con Dios," translated is "go with God." We are more apt to say, "May God go with you," but wouldn't it be much better to say, "May you go with God"? We might go where God would not want to go with us, but if we "go with God" we will always go the right way. One of the most difficult tasks we have is to move with God. We have our agenda, complete with details; and we offer it to God for His approval. That is the exact opposite of the desired procedure. It is not usually the case that God’s agenda is the same as ours, unless we have checked with Him first and made His agenda our own. We don’t usually do that. 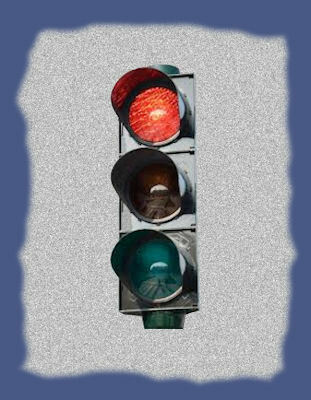 God has “traffic signals and signs” that He wants us to obey. Sometimes He says, “Go.” Other times He says “Wait” or even “Stop.” What He desires is instant obedience to the signal He is sending. In vehicular traffic, it is vitally important that we observe the stop-s and go-s and use the caution-s to be alert to a change. Not obeying these directions can be disastrous, for us and others. “Because of his strength will I wait upon thee: for God is my defense.” (Psalm 59:9). That is an excellent reason to wait upon God—because of His strength. His strength works in and through us when we wait and walk with Him. “I wait for the Lord…” (Psalm 130:5). We can predetermine to wait upon God and make that decision each time we become impatient and become tempted to run a stop sign He has posted. “To every thing there is a season, and a time to every purpose under the heaven.” (Ecclesiastes 3:1). The Psalmist said in Psalm 119:33-35 “Teach me, O Lord, the way of thy statues…Give me understanding…Make me to go in the path of thy commandments…” If we could hear the cry of God’s heart toward us, it would echo those words. He wants us to come to Him to be taught, given understanding and direction for right living. How pleased He would be if we always adhered to that standard and prayed “Shew me thy ways, O Lord; teach me thy paths. Lead me in thy truth and teach me…” (Psalm 25:4-5) and concluded the prayer with I will “Rest in the Lord and wait patiently for him.” (Psalm37.7). Our problem is that we want to run our own lives. We are not bold enough to say that we know better than God what is best for us, but our very actions indicate that we trust our judgment better than we do His. Isaiah 52:12 admonishes “For ye shall not go out with haste, nor go by flight: for the Lord will go before you; and the God of Israel will be your rereward.” If we travel with God, He will go before us to lead and follow us to protect our back. We can usually tell if the motion promptings are from God or Satan. Satan will urge us to “go out with haste” and ignore the traffic signs, while God gently leads and encourages us to follow. If we need further advice about waiting, we can find it in Isaiah 45:2 “I will go before thee, and make the crooked places straight…” God cannot go before us if we don’t wait for Him. If we are unable to wait, then the reverse would be true: The places that would have been straight will be crooked and the way hard to find. But “…blessed are all they that wait for him.” (Isaiah 30:18). That is a great motivation to observe God’s stop (wait) signs. Israel waited at the Red Sea thinking surely their time had come to be recaptured by the Egyptians. Moses had had a lot of experience waiting. He spent forty years in the backside of the desert after killing the Egyptian and fleeing Egypt. In Midian he had heard from God at the burning bush and was still listening at the seaside. He told the anxious people, “Fear ye not, stand still, and see the salvation of the Lord….the Lord shall fight for you…” (Exodus 14:13-14). God’s visible presence guided these wandering Israelites in the form of a cloud by day and a fire by night. When the cloud stopped, they waited. They did not continue their journey until the cloud moved again. If they had not waited, they would not have known the best way to travel toward the Promise Land. Many enemies would have been lurking in wait to hinder them. Even after the light changes from “stop” to “go,” it is necessary at times to proceed with caution before advancing. After Paul’s conversion and his waiting time in the desert, he proceeded at full speed ahead. He was setting up churches, making converts and enjoying mostly great success wherever he traveled. On one of his journeys, he wanted to go into Asia on a missionary trip, but was “forbidden by the Holy Ghost to preach the word in Asia.” So his company turned toward Bithynia, “but the Spirit suffered them not.” (Acts 16:6-7). It wasn’t God’s agenda, it was Paul’s. God told Paul in a vision to go to Macedonia. So he adjusted his agenda to agree with God’s and went to Macedonia because there was a ripe harvest waiting, and they reaped it for Christ. After all the wilderness hardships, the Israelites finally were nearing the Promise Land. At the very edge of the end of their journey, they had to stop. Spies were sent into the land and came back with a double-sided report. Two of the spies were jubilant and full of faith. “We can take it; let’s go at once,” they reported. However, ten naysayers came back filled with fear of the “giants” and walled cities; they gave an evil report. The people listened to the negatives and heeded the warning of the fearful reporters. They were ready to return to Egypt! Many people start out serving God only to turn their backs when things don’t turn out as they expect. The victory and prize belong to those who persevere, not to the turncoats. All the pleading of Caleb and Joshua, who had faith to believe that God would successfully give them the land, didn’t change the doubts that the other ten spies had sown. The people wanted to stone the bearers of good news! They didn’t want to hear that God would be with them to take what He had already given them. They erected their own Stop sign. It is unfortunate, but one voice of doubt can drown out a host of faith-filled saints. And when the majority of the voices are filled with doubt, it requires steadfastness to go against the doubters. When God speaks and changes the light to “Go,” then is the time to rev up our engines and get under way for what He has called us to do in spite of negative opposition. It’s amazing that a small fixture hanging in the middle of an intersection equipped with three different colored lights can stop huge vehicles with eighteen wheels. It is the “authority” behind that small apparatus that causes all traffic to stop, use caution or go. So it is with God’s Word; it is the authority of the Word that spurs us on to go and do great things in the name of God. When God says “go” He has already opened up the way and made advance preparations for success in the endeavor. He is the traffic director at each intersection. After the flood, God told Noah, “Go forth of the ark.” (Genesis 8:16). It was time to get on with life on earth and replenish it. God told Abraham to “Get thee out of thy country…unto a land that I will shew thee:” (Genesis 12:1). He didn’t have a road map even to his next destination. He had to go in faith. If he had stayed in Ur, he would never have fulfilled the destiny God had planned for the Father of Israel. There is a time for everything. A time to go; a time for caution; a time to stop, wait. Jesus told his disciples that after He left them, He would send the Holy Ghost who would tell them all things that they needed to know to fulfill the mission He was leaving with them. “…he shall teach you all things, and bring all things to your remembrance whatsoever I have said unto you.” (John 14:26). However, He told them to wait for the Holy Ghost, which would give them power and authority to complete the mission. It was said of them that they turned the world upside down (actually right side up!). If you sit too long in traffic after the light turns green, you will soon hear honks of the horns of the cars behind you. It is good for God to place “honkers” behind us when we hesitate to go forward when it is time. The Holy Ghost acts as a “honker” to urge us on to the task we have been anointed to do. Forty years before he was ready, Moses enthusiastically jumped into position to be the leader of the Israelite slaves to bring them to freedom. They rejected him. After he had been in God’s school for forty years and had learned how to survive in the desert, he was prepared; but he wasn’t willing. God had to “honk” at him from a burning bush that was not consumed by the fire. Thank God for burning bushes when we need a boost at the “Go” signal! God’s method seems to be to bless us first. If that doesn’t get our attention, then He will remove the hedge and allow troublesome experiences to bring us to repentance and commitment. Whatever He has to do, He will—to bring us home. When Peter recognized that it was Jesus who had told them to let their fishing nets down on the right side of the boat after an unsuccessful night of fishing, that abundant blessing of nets overflowing with the catch caused Peter to feel like a “sinful man.” God’s first choice is to bless us and enlighten us to His glory and holiness, but if that doesn’t stir us, He has other methods He will use. It would be so much better if we would just “cast our nets on the right side” to begin with and move with God’s stop-s and go-s. We could save ourselves a lot of heartache and not have so much lost time to make up for if we would be sensitive to the leading of the Spirit in everything we do and not wait for a burning bush, a honker or trouble to bring us to God’s agenda. Here’s my pen and paper; God, say on! I want your agenda and travel plans! * There are several ways you can navigate through our site. See this page for routes.